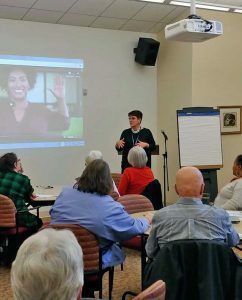 Lisa Courtice, President and CEO of the United Way of Central Ohio, leads a fundraising discussion at the Dominican Sisters of Peace Founded Ministries meeting on March 19, 2019. Educational presentations by Lisa Courtice, President and CEO of the United Way of Central Ohio, and Matt Habash, President and CEO of the Mid-Ohio Food Bank, were featured. The attendees also spent time planning and idea-sharing. Gail Race of the Siena Learning Center in New Britain, CT, was surprised by the diversity of the ministries represented. “The Founded Ministries team – including those of us working in the ministries – is just an incredible wealth of knowledge,” she said.